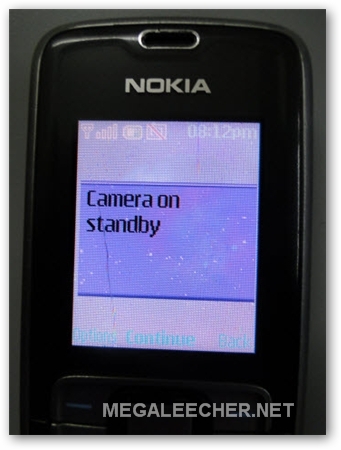 Few days ago my friend came to me with a very strange error on his Nokia phone - whenever we tried clicking a picture/movie from phone's camera it just waited showing 'Camera on standby' message indefinitely on the phone screen after taking the picture as shown below. After searching the web the only solution users were suggesting were either a faulty camera chip or corrupted phone software, however I was pretty convinced that this was not the case and after tinkering here and there I finally found the solution. The solution to the problem is surprisingly simple and all you need to do is to make some space on Phone Memory so their is enough room to process the temporary files, Actually the confusion arises because of the way Nokia handles the error instead of a simple "Phone Memory Full" error the phone simply sits on the 'Camera on standby' message trying to process the captured image which it could not because of insufficient phone memory. I love you, you saved my day. This would fix my problem other than that I only just got the phone and therefore haven't put anything in the memory yet. The camera very ocassionally works but most of the time says camera on standby - any suggestions? Phone Memory has 10.7 MB free space. but problem is same camera on standby and blue tooth, radio also not working. You need to change save directory folder.. i just solved problem in my Nokia 3110.. I just got a nokia phone and service was started today. It worked fine yesterday when I shot a picture but today when service was started I only get the sweet "Camera on Standby" view. I called the att store. The guy told me to do a wipe and I did, wiped it to manufacture standards and nothing! He said return it as it is defective. Works for me since it is brand new, not so much for others. Mine also had no memory used other than 27 contacts put in. That is nothing in the grand scheme of things. There are MANY posts like this. I'm wondering if I should get a different phone all together!!! I have nokia 2700. When i want to start the camera it write camera standby. What can i do?